Glenda Jackson, Daniel Massey, Yvonne Mitchell et al. 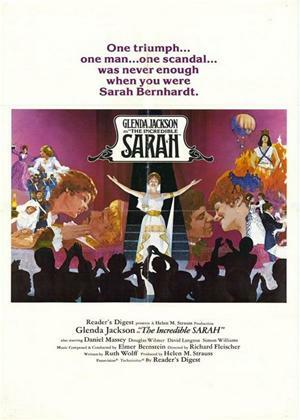 The legendary actress Sarah Bernhardt's unconventional life and career are examined in this biopic. At an audition in 1860, the teenage Bernhardt proclaims herself the greatest actress of her time. Her career blossoms, as does her private life. But art and life don't stay balanced, much to the frustration of her lovers. The eccentric Bernhardt eventually does marry another actor, but it's her life on stage that ultimately gives her the most satisfaction.